Guess what? Tomorrow's my 19th birthday.. so this is my last piece of wisdom as an 18-year-old! Yay! So let's put some wisdom in your Wednesday with this one..
What I really mean about this one is… STOP BEING LAZY. 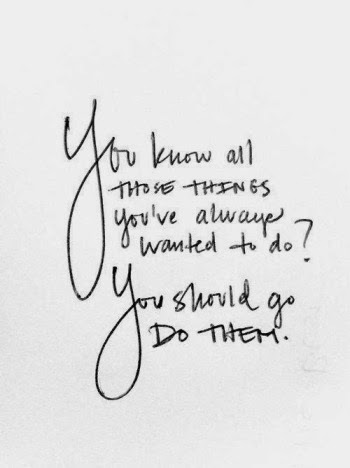 Go out and do something with your life. Just kidding, but not really. If it's one thing I've learned in my lifetime, it's that life is waaaay too short. One day someone could be with us, and the next they're gone. You have to appreciate every moment and every person and every opportunity. And I've been trying to do that. Before I started this blog, I talked about doing one for months. I went back and forth with names, and ideas, and themes, and finally one day I just sat down with my laptop, opened Wordpress and typed away. I realized me saying that I wanted to do it wouldn't make a difference if it wasn't done. I may say I want to give to charity, but if I don't give then I haven't done it. My mom told me last night, "the road to hell is paved with good intentions".. and it's so true! Just wanting to do stuff isn't enough today, we have to actually DO it. So, let go of all of your fears, and just do it (sorry Nike, I didn't mean to take your phrase!).. get out of bed, put on some makeup, and go take over the world! Top industry leaders from Cosmo, Teen Vogue, Glamour, Seventeen, Levo League, Redbook, NY Daily News, Huffington Post and more will be hosting keynotes, sessions and panels at the conference. On top of that, you also receive goodies, and extras like a BCBG sample sale, free manis, braid bars, movie screenings and lunch from Chipotle (with a gift certificate!) I wish I could go. Anyways, if you're interested and in the NY area (or are willing to take a train, bus, car, plane, automobile, whatever), you can sign up here! I don't want to hear any excuses: this is your life, do what you want with it! Happy Wednesday and happy early birthday to meeee! Have you heard about the HC Conference? Will you be attending? What do you think about today's quote? I found your blog on the Her Campus website and I just wanted to stop by and say hi! You have such a cute blog and I can't wait to read more! Love the advice, great post! Totally wish I could go, too! Ugh, crossing fingers for next year. I went to a conference in NYC this March and saw most of these speakers but they were all phenomenal, I'd die to go again! Happy Birthday, Caroline! You are spot on with your Wednesday Wisdom! Life is certainly too short so you gotta live it up! Hope you're doing so today on your birthday! Happy birthday you young little thang!